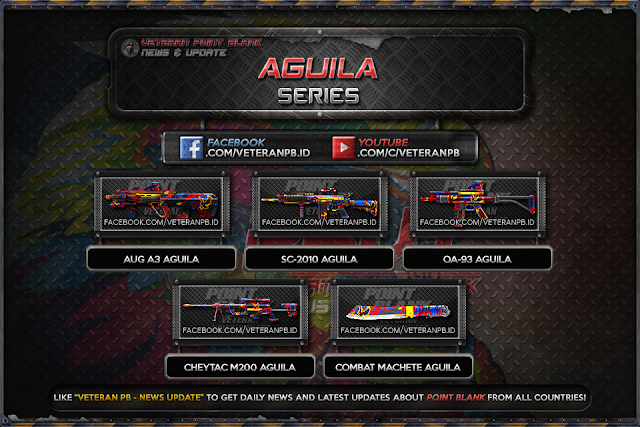 Hello everyone, at this time I will share about Aguila Series Point Blank Garena Indonesia (PBGI) for Counter Strike 1.6, Condition Zero, Counter Strike Point Blank, Counter Strike Revolution and Counter Strike Extreme. Aguila is created with red blue yellow camouflage pattern with 'Aguila' (Eagle) logo on the weapons. Aguila dibuat dengan pola kamuflase merah biru dan kuning, dengan logo 'Aguila' (Elang) pada senjata. Aguila é feita com um padrão de camuflagem vermelho azul e amarelo, com o logotipo 'Aguila' (Águia) na arma.